The "Big Bang Theory" star shared some big relationship news in one short Instagram post. "The Big Bang Theory" will soon return to prime time for one last season. 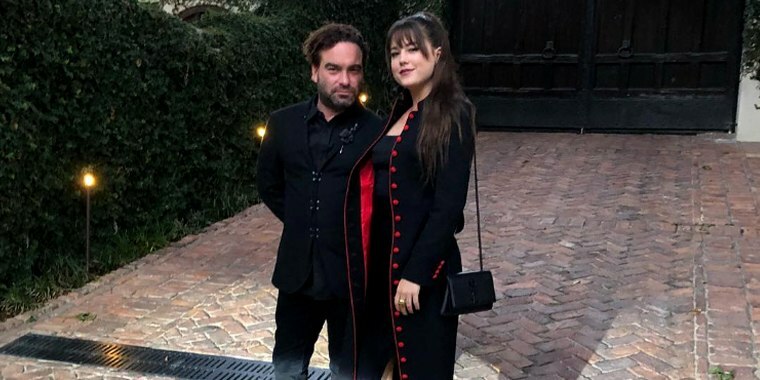 But before the goodbye run of the beloved series kicks off, star Johnny Galecki (aka Leonard) wants his fans to say hello to his new love. The 43-year-old actor shared a sweet photo of him and his 21-year-old girlfriend on Instagram Monday, from their pre-Emmys party outing the night before. "Last night was wonderful," he wrote alongside the shot in which he and Meyer were cuddled close to each other. He also added a "thank you" to the night's host, producer Jeffrey Katzenberg — even though Galecki's focus was clearly on Meyer in the pic. And he wasn't the only one sharing their love online. Meyer, who works as a welder, according to Us Weekly, also took to social media after their evening out. But unlike Galecki, this isn't the first time she's made their relationship Instagram official. She's posted featuring the actor since July. And she's even shared a behind-the-scenes shot from the set of season 12 of "The Big Bang Theory." "Keeping it spicy & salty," she wrote in the caption. Viewers will have to wait and see if she somehow shows up in front of the scenes, too, when Galecki and the rest of "The Big Bang Theory" cast return with new episodes Sept. 24.